This time around, Panasonic isn’t trying to reinvent the revered 1200. With the new MK7, the company is only making minor improvements, including a new coreless direct drive motor that promises to completely eliminate an effect called ‘cogging’ where electric motors occasionally feel like they’re stuttering during slow rotations. It’s a problem that affects electric cars too, and one that Panasonic believes it’s solved by removing the 1200 MK7's iron core, and optimizing the space between the magnets that make the MK7's platters spin. There’s some complicated engineering refinement going on, but the end result is a turntable that always spins smoothly at any speed. Other upgrades on the Technics SL-1200 MK7 include the ability to play in reverse, which also requires the cartridge and needle being used to support reverse play. (They often only work in one direction.) And using technologies the company developed for Panasonic’s Blu-ray players, the 1200 MK7 incorporates new motor control electronics that promise to further improve its use for scratching vinyl. Users can also adjust the amount of torque the SL-1200 MK7 uses to start and stop its spinning platter to better suit individual performance preferences, and its all-black matte chassis (which includes an all-black tone arm) is now made of a mixture of aluminum and fiber glass for improved rigidity and reduced vibrations and needle skips, even those coming from a loud venue. 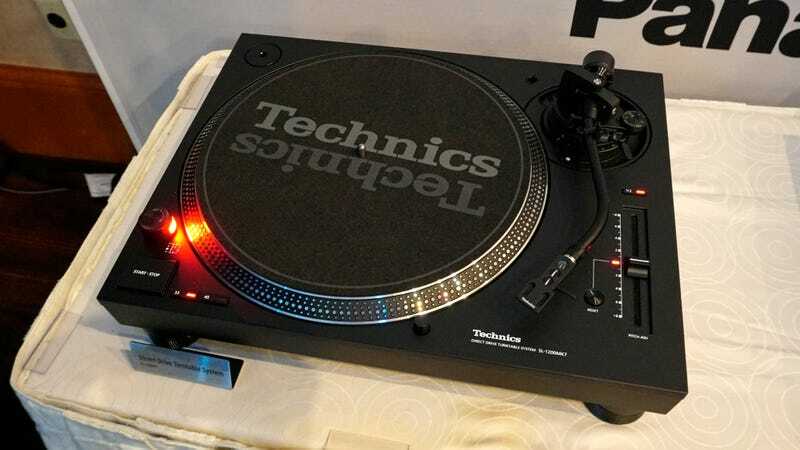 Panasonic hasn’t revealed when the Technics SL-1200 MK7 will be available or how much it will cost, but we’ll update with those details when we know more. What the Hell Is Technics Thinking?